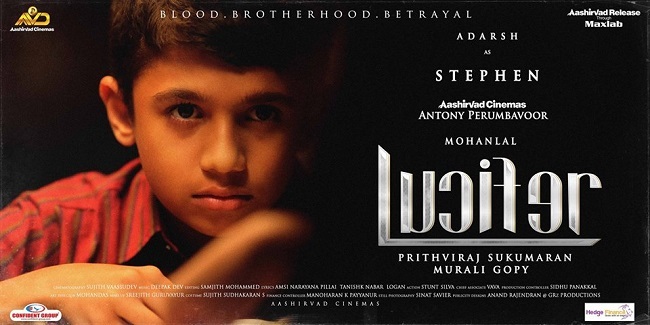 From child actors to supporting ones, here's a list of who's playing who in 'Lucifer'. 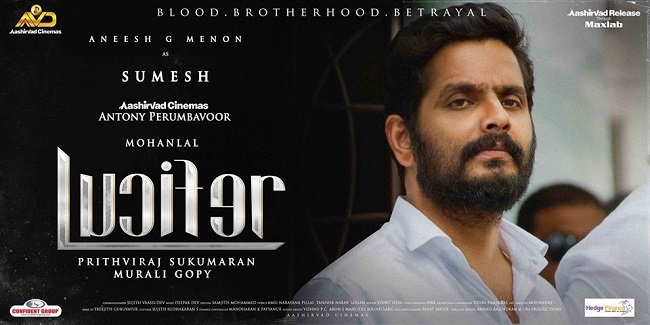 Lucifer has already been hyped much - actor Prithviraj turns director with the film, the male lead is none other than Mohanlal, the writer is Murali Gopy, it is a political thriller, more stars have joined – the news bits have been dropped one after the other, all to rouse your already-kindled interest. 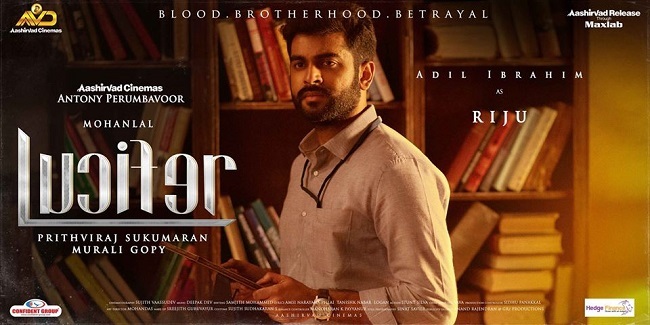 That Prithviraj, not just a prolific actor, but also one known to have tremendous knowledge of cinema and its technicalities, is making a film should itself make you curious. But he has been quite uptight about it – understandably – he wouldn’t want too many details out too soon. But finally, the team decided to satisfy some of our curiosity. They announced the entry of Manju Warrier and Tovino Thomas into the cast, of Bollywood actor Vivek Oberoi and Malayalam director Fazil. 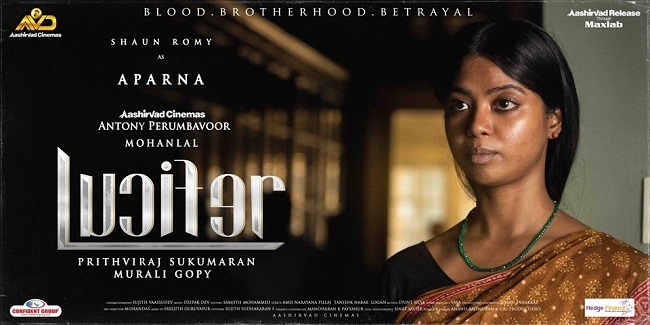 There is also Mamta Mohandas and Prithvi’s brother and actor Indrajith. And now, the character reveal posters are coming in one by one. It's 13 so far, and not including the lead actors. Here are the first 13. 1. 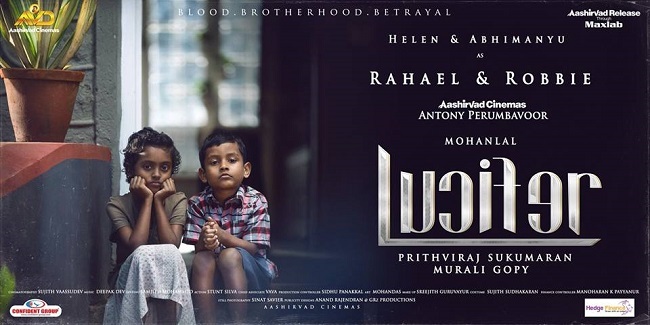 Rahael & Robbie - The first characters to be introduced in the Lucifer team are surprisingly two children, played by Helen and Abhimanyu. Rahael and Robbie are sitting on the steps outside a house and you know they have a story to tell. 2. 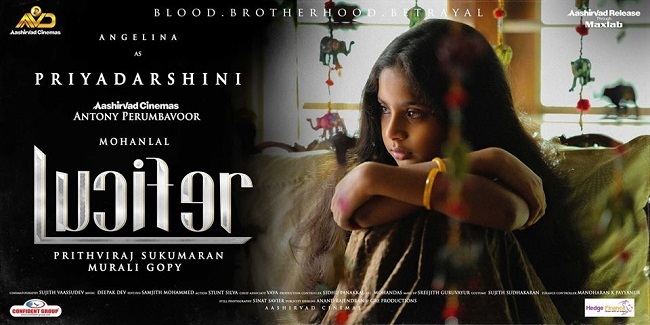 Priyadarshini - Angelina with her long hair and expressive eyes plays the little girl Priyadarshini. 3. Stephen - Adarsh plays Stephen, another child. 4. 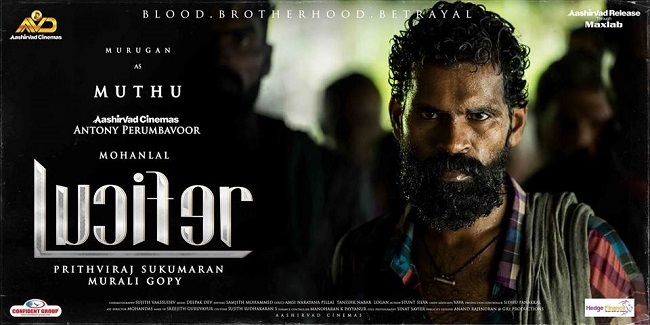 Muthu - Murugan, reported to have played supporting characters earlier, appears raw and rough in his role as Muthu in Lucifer. 5. Aparna - We saw her de-glamourised look in Kammattippadam and then got surprised watching her transformation, appearing as a model off screen. Prithvi must have liked Rajeev Ravi's characterisation of her, for Shaun Romy as Aparna appears in a de-glam look again. 6. Riju - Adil Abraham plays Riju and for a change (from the bunch of characters we are about to meet), he is not dressed in white. He could be an official, a professional, and if some earlier reports are to be believed, a civil servant. 7. 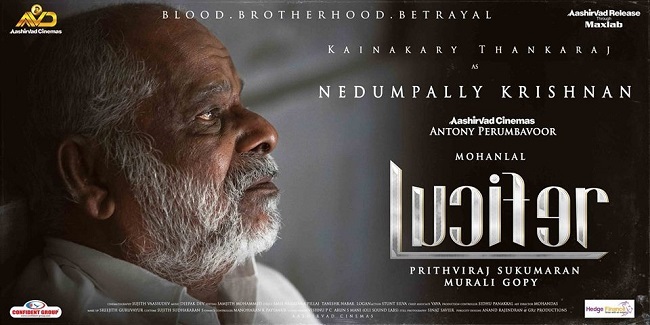 Bhadran - The seventh poster that came out was Bala's playing Bhadran, looking different from the characters he has played before. Bala had been the antagonist in Prithvi’s 2009 movie Puthiya Mukham. 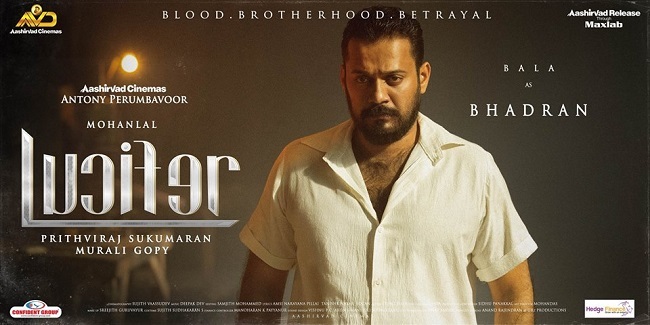 In Lucifer, Bala wears white, looks tough. And that's all you get to know from the poster. 8. Nedumpally Krishnan - Kainakary Thankaraj plays the old Nedumpally Krishnan, looking dejected, reminding you quite of the sad looking dad of Ee.Ma.Yau., who throws all to the wind and dances his last dance before dying on a seashore. He is perhaps another dad or just an old wise man in Lucifer, bringing in his wisdom, some emotion. 9. 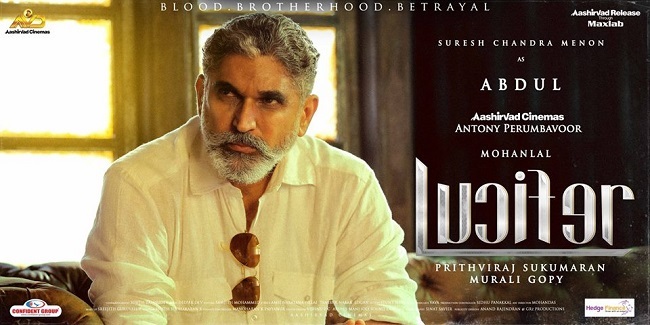 Sumesh - Aneesh G Menon, appearing in all sorts of supporting roles, known most perhaps for his role as the politician brother-in-law in Drishyam, becomes Sumesh. Sporting khadar-white, he is probably playing a young politician. 10. 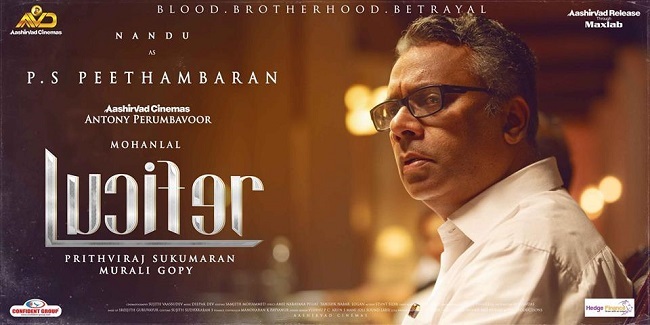 Mayilvaahanam - Tamil actor John Vijay, occasionally appearing in Malayalam cinema, becomes Mayilvaahanam in Lucifer. 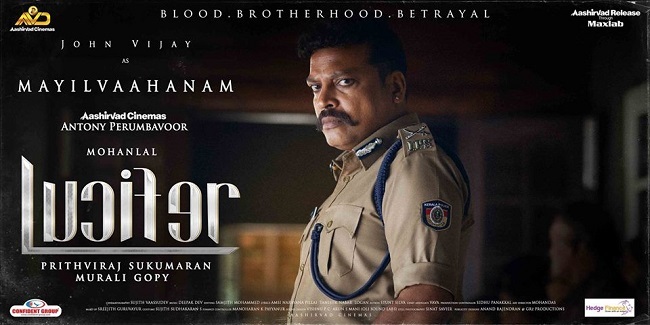 Obviously playing a Tamil man with a name like that, he turns a cop with a typically curled-up moustache and ear studs. 11. 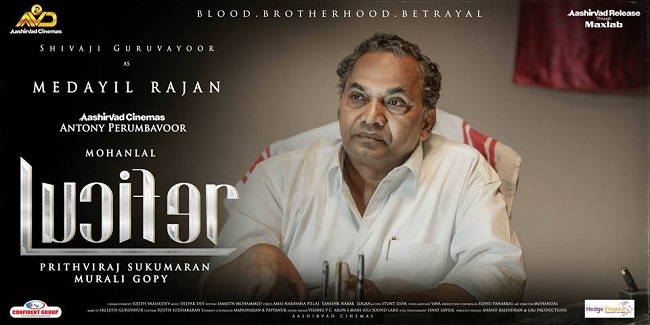 PS Peethambaran - Nandhu, one of the most versatile actors of Malayalam, plays Peethambaran, and from the looks of his character poster, another politician. He is known to occasionally play the comedian but you can't gauge that from the serious expression on the poster. 12. Medayil Rajan - The familiar face of Shivaji Guruvayor, sitting almost predictably on an office chair - most likely a minister's - appears. He looks a lot like the Karunan he played in Arabikkatha, the betraying politician. But he could easily be one of the nice guys, if there are any, in Lucifer. 13. Abdul - Suresh Chandra Menon, actor, cinematographer and filmmaker known mostly for his role in the Tamil film Pudhiya Mugham, as the loving husband singing ‘Kannukku Mai Azhagu’ to Revathy, appears as Abdul. Grey and black hair and beard, sunshades hung on his white shirt, the only guess you can make is he can't be doing comedy looking like that.